Anne Abreu is an experienced medical device professional with an expertise in reimbursement, marketing and strategy. She is sought after by early stage companies to evaluate their reimbursement landscape, clinical and marketing strategy prior to commercialization, as well as to refine strategy and implement programs to support reimbursement after products are launched. Anne has over 15 years experience in the medical device industry. 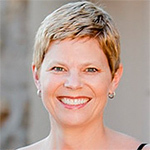 Prior t0 starting her own consulting company, Anne held leadership roles in companies including Sonitus Medical, Ventus Medical and Guidant/Abbott Vascular. She holds her MBA from UC Berkeley Haas School of Business and her BA from Colorado University at Boulder.